GEARWRENCH’s new 120XP™ Micrometer Torque Wrenches feature a three-degree swing arc allowing for access to more spaces. It has 120 positions in 360 degrees just with the three-degree swing arc. It is available in 1/4", 3/8", and 1/2" drive sizes with accuracy of ±3 percent. The flattened low-clearance beam enables users to tighten a wider range of fasteners. Its knurled aluminum grip with flared ends allows for more user control. It has a low-profile teardrop head and a flush mounted on and off switch for more accessibility in tight spaces. The featured high-definition scale markings are displayed in white over black allow for easier legibility. SPARKS, Md., Oct. 29, 2018 /PRNewswire/ -- When there's almost no room to maneuver, a single degree can make all the difference to getting the job done. That's the thinking behind the new GEARWRENCH® 120XP™ Micrometer Torque Wrenches, which provide an industry-leading, three-degree swing arc to access fasteners in the tightest of spaces. GEARWRENCH, a premier brand of hand tools and accessories from Apex Tool Group, developed the 120XP Micrometer Torque Wrenches to deliver 120 positions in 360 degrees for a mere three-degree swing arc. Available in 1/4", 3/8", and 1/2" drive sizes with accuracy of ±3 percent, their flattened low-clearance beam allows users to tighten fasteners other ratcheting torque wrenches can't. A midpoint-marked knurled aluminum grip with flared ends puts your hand in perfect position for precise control. "Access is a critical capability of tools for mechanics, techs and others who need to get into tight spaces," said Paul Steinweg, Product Manager. "If you can't get into a spot, having a tool that's even a millimeter smaller can make all the difference." The low-profile teardrop head and flush mounted on/off switch further improve accessibility in tight spaces. High-definition scale markings are displayed in white over black for outstanding legibility. Torque Wrench tightens caps/tubes without damaging them. Torque Wrench works with hubless soil pipe connectors. 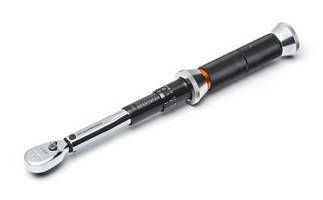 Torque Wrenches are used in aircraft maintenance/inspection. Spline Wrenches have Anti-Slip Design on open ends.